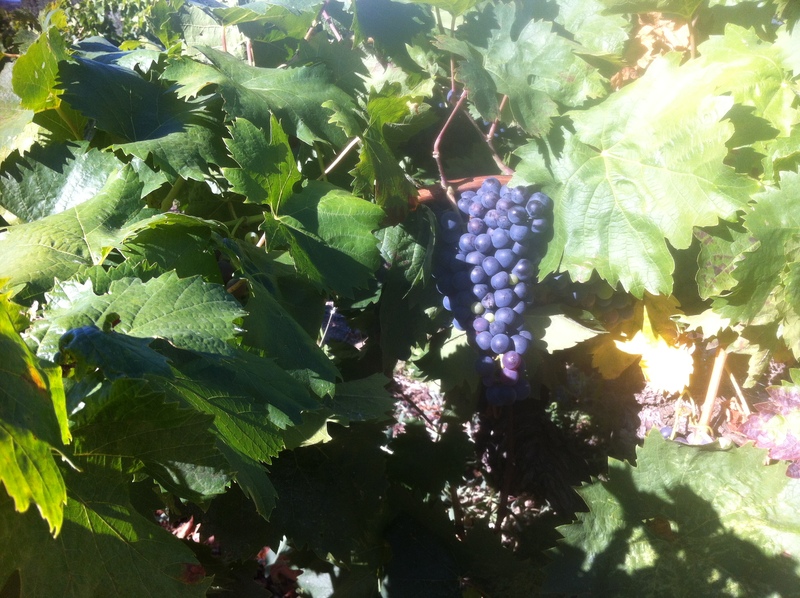 Wednesday was the second day of the grape harvest at Domaine de Cébène. Sunday, the first day, I mostly stood around and took pictures of other people working. The vendange was supposed to begin Saturday, but the weather didn’t cooperate. Rain poured down and removed a bit more of my bathroom ceiling which had partially collapsed during the previous storm. (Help is on the way!) Sunday dawned dry with partial sunshine. 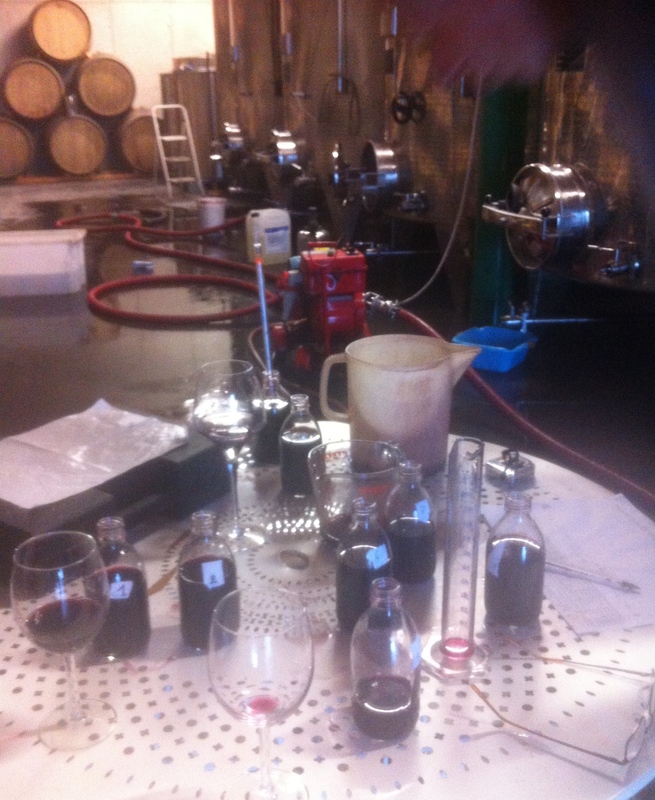 By noon about half of the Syrah had been picked and was in the vats on its way to becoming wine. My contribution to the first day of harvest was a pasta salad which I went home to make while everyone else was picking grapes. After the grapes are picked, the crates are taken by tractor, if there’s one available, or truck to the cellar. The grapes are then emptied into the egrappoir, a machine that removes the stems and sends the grapes down a chute and into a fermentation vat in the cellar below. After watching Brigitte work at the egrappoir, I decided to have a go myself. It felt a bit like a Lucille Ball skit. The grapes, sans stems, roll down the chute like pinballs and if you don’t move them along fast enough they pile up and spill over.Soon I was elbow deep in Grenache, pushing grapes in one direction as more spilled down the chute towards me. Brigitte mentioned at one point that it would be very dangerous to fall into the vat below as the gasses given off once the fermentation starts are lethal. I tried to keep that in mind. A more immediate problem was my back which after 30 minutes began to protest. A good experience though; interesting to think that at some future point I may drink a glass of wine that I’ve had a hand (literally) in producing! After living in France for two and a half years, days can seem quite ordinary and routine; I shop for groceries, work, meet friends, all in all not much different than life back in the States. Yesterday though was one of those days in which I had the sense of how different it is to live here and how incredibly lucky I am to be having this experience and, even more so, to have met Brigitte and have the opportunity to get a first hand look at the life of a vigneron. I drove to the cellar in absolutely torrential rain which went on all afternoon. 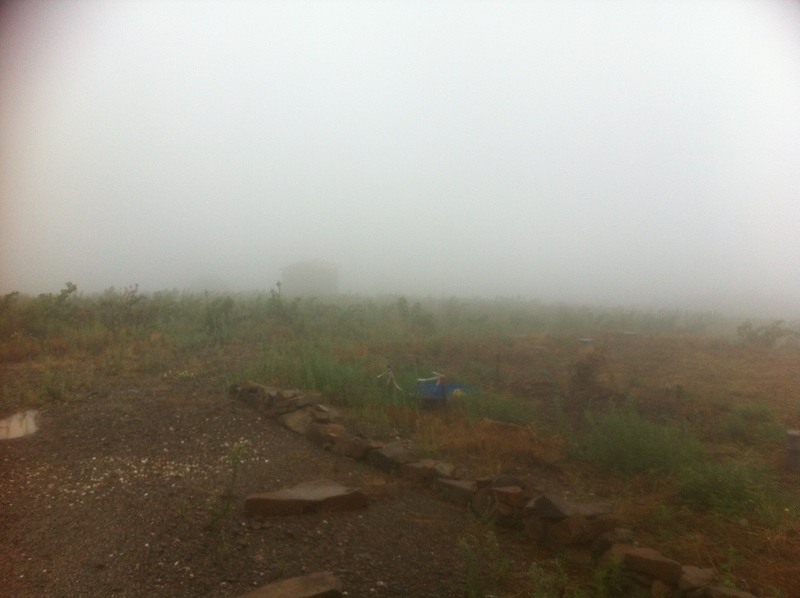 The cellar is on a hilltop and low clouds and mist hung over the vines; I couldn’t even see the mazet further down the hill. Inside, Brigitte and Pierre were doing some fine tuning on the blends before the bottling of the 2014 vintage on September 3 & 4. I was going to say last minute fine tuning, but Brigitte said they would probably still be making adjustments right up until the wine was in the bottles. They were also draining the lees, the residue that sinks to the bottom of the vats–vats that in just a few weeks will be filled with the fruits of this year’s vendage. All around the cellar were the boxes and crates of Domaine de Cébène wine which will be shipped all over Europe, Canada, China and, soon, the US. As rain beat on the roof and thunder rumbled, I watched Pierre scramble up ladders, watched Brigitte making notes about a blend they had just tasted. More thunder and the lights briefly flickered, Brigitte looked at me, shrugged and went on working. It was noon and they still had hours of work to do. It’s not just how the wine tastes at this moment, Pierre had explained, it is how it will taste when the sommelier opens it, maybe five years from now. I imagined this, a bottle of their wine being uncorked in a fancy restaurant somewhere, five or ten years from now, perhaps on another continent and I watched the work going on around me. I had the sense of being backstage in a theatre. On opening night, it’s hard to imagine all the hard work that went on behind the scenes to create the polished production. I felt very privileged to be a witness to this one. When I left, Pierre gave me a plastic water bottle filled with some of the lees. Very good for making coq au vin, he said. I will definitely have to try it. Life in France is very good and sometimes thrillingly different. Almost a year . . . The end of this month marks my first year in Laurens; I came here after spending four months back in the States. It’s been another terrific year in France, hard to believe how at home I feel–the apartment, the friends I’ve made, the work. Soon after I arrived in Laurens, I mapped out a walk, about three miles, which I do most days. Because it’s the same walk (through one road that winds through the vineyards, around the chateau and back to the village) it makes me very aware of the different seasons. Above a chilly January walk, winter red nose, bundled up in scarf and hat. I’d return to the apartment shivering and wet. In February it even snowed for all of one hour and lasted about that time too. 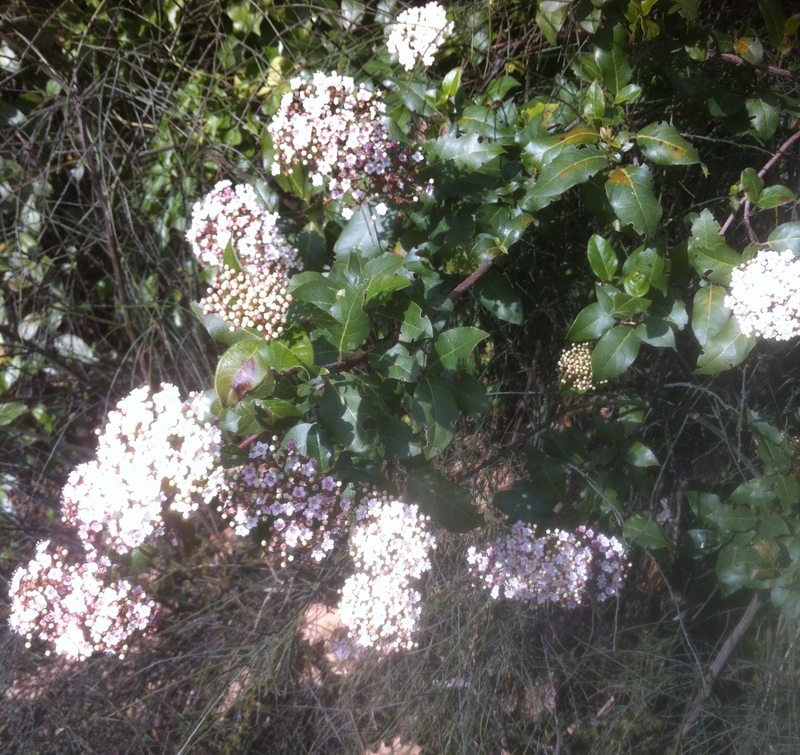 March, April and May brought wild flowers in all different colours. I’m not an artist, but springtime is the season when I truly wish I could paint. Summer this year was brutally hot. For weeks during June and July there were days of 90 plus weather and some days it didn’t cool much below 80 at night. Too hot for me. I’d been walking in the late afternoon, but I had to change things around and walk in the mornings and if I didn’t start out by 7, the sun was too intense. I had fans going in the apartment, the shutters closed to keep out the heat, but some days it was too hot to even think. One day, I packed up the laptop and drove to a McDonald’s in Pezenas and worked while trying to resist the lure of French fries. Except for the French spoken all around me, I could have been in any McDonald’s back in the States. But while I wilt, the grapevines thrive in the summer heat. As I walked through the vineyards in early summer, the vines were all long sprawling branches like gangly teenagers. Just a few months earlier, I’d been looking for the first baby leaf buds. The grapes, small and green at first seemed to grow bigger by the day and by July were beginning to change colour. Back in the States, I always thought of August as the dog days of summer, but here in France–or at least on my walk this morning–I felt a bit of autumn in the air. Last night it rained and this morning the sky was a clear pale blue. Some clouds still lingered over the hills and at 7:30 there was almost a chill in the air. The grapes are hanging in purple clusters, blackberries are ripening, figs and olives not quite there yet; I definitely have my eye on the figs. After all the heat of June and July, I’m loving August! In a few weeks, the grapes will be ripe and ready to pick and head off to the vats for what Brigitte calls their education. Once the grapes are gone, the leaves wither and fall from the vine and it’s all quiet in the vineyard again until next year. Springtime and visitors. . .
Facebook has a new feature, or maybe it’s been around for a while and I haven’t noticed. A few days ago when I logged on, I was shown an entry for two years ago on the same date. Newly arrived in France, I was living in the Dordogne where, even though it was supposed to be spring, the weather was rainy and cool. 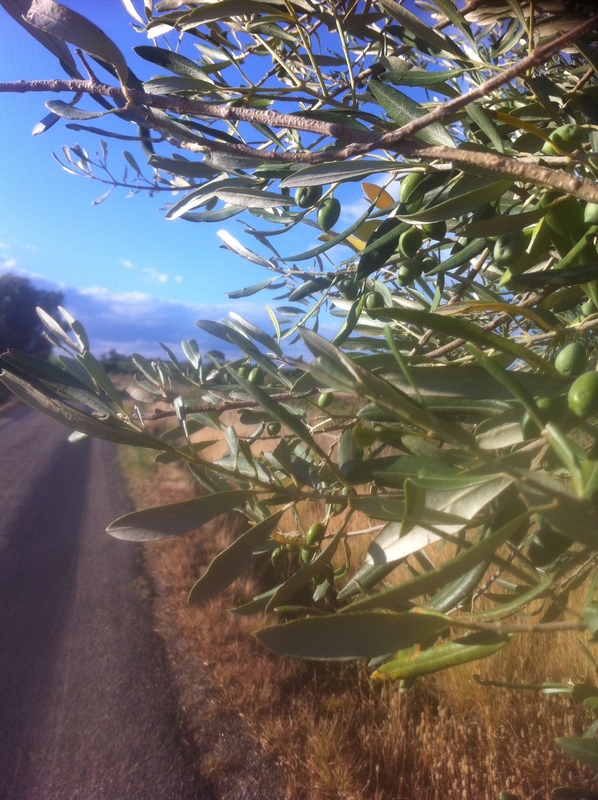 Two years on, living in the Languedoc where spring has not only arrived but seems ready to pass on the mantle to summer. Just a few weeks ago, I was still looking for the first leaf burst, now it’s a sea of pale green all around the village. 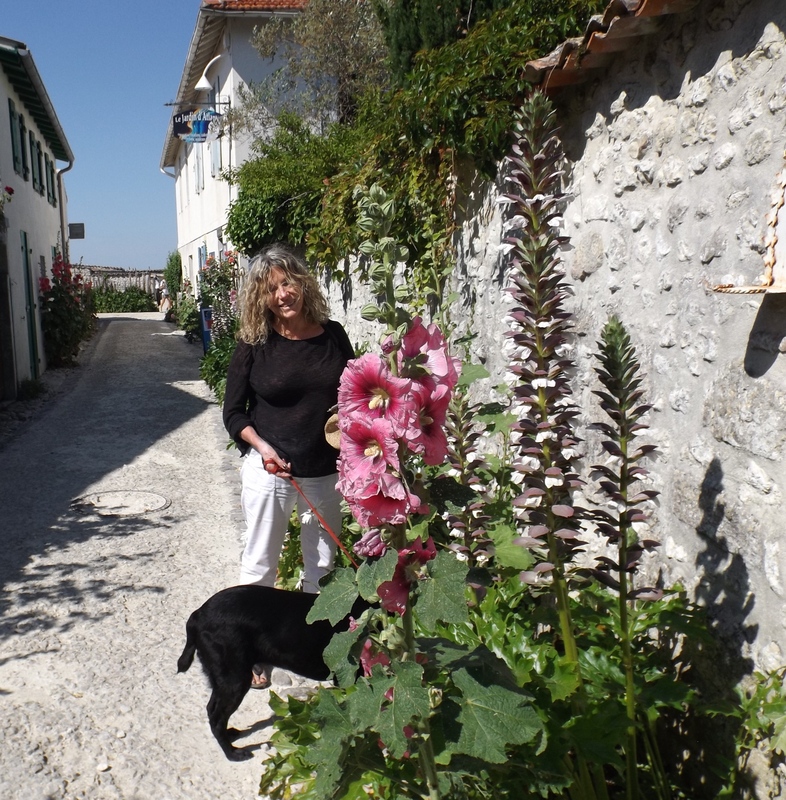 Temperatures climbed into the 80’s on a couple of days and the fields and garrigue are a riot of colours– pink, lavender and yellow, splashes of scarlet poppies, and great clumps of purple irises. Also just about two years ago, I’d had my first visitor from the States. 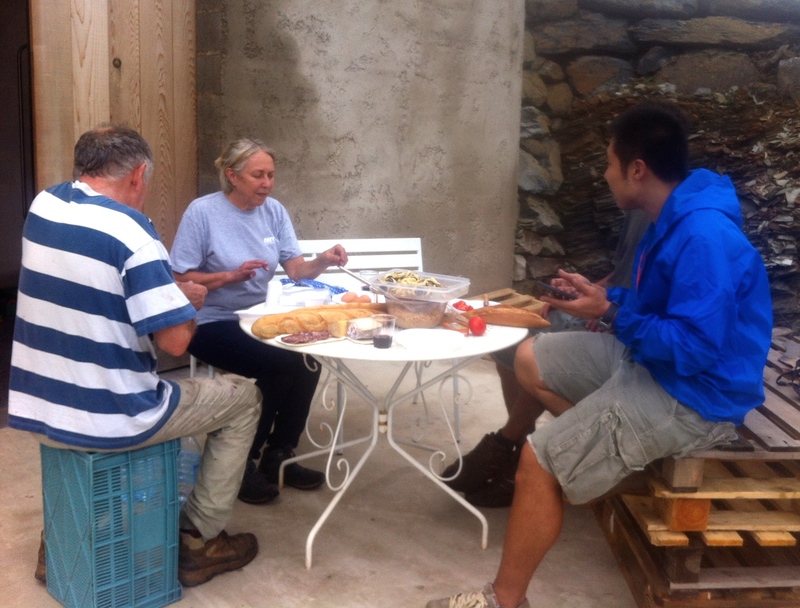 Kit, who had been visiting Ireland, took a train from Paris to Bordeaux where I met her. We roamed around for a couple of days then took the train to Perigeaux and rented a car to drive back to my village. 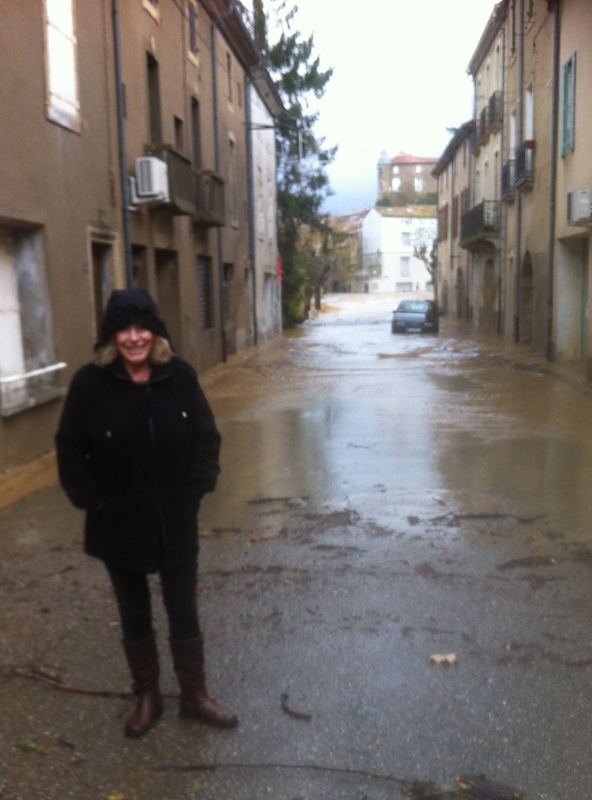 After driving in California for years, I have no idea why getting behind the wheel in France completely freaked me out, but it did–to the point that Kit drove the rental car and turned it back in Perigeaux at the end of her visit. I was sans car until I moved to Montpeyroux in the Languedoc and found dependence on buses and trains a bit constricting. A friend let me drive her truck and, after tooling around the vineyards, a few times I was ready for a car of my own. 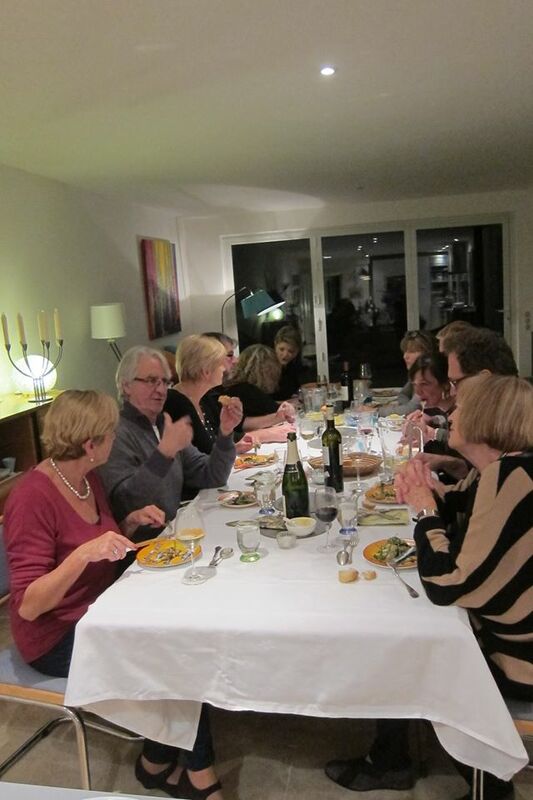 This time, I thought nothing of driving to Barcelona to meet Kit and her husband Jerry– my first US visitors in 2015 and the first to Laurens where I now live. Kit scores big in the department of firsts. Having visited Bordeaux and Barcelona together, we thought it might be interesting to visit all the B cities of Europe. We’ll see. Anyway, it was a good visit. From Barcelona, we drove to Cadaqués, which never fails to thrill then back to Laurens. 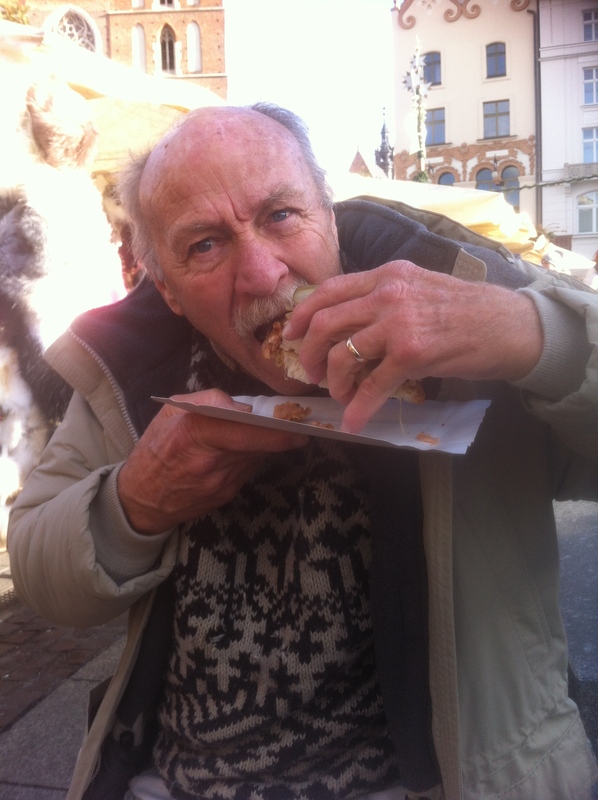 We ate grilled steak at a vineyard lunch, plates of mussels at a street fare and seldom passed a cheese stall without making a purchase. Ditto the boulangerie which Kit visited every morning. For the most part, she’d point at whatever took her fancy, essentially almost everything, then stagger back with the spoils. Pictures tell the story. As Kit said, 12 euros and ten minutes later. If it looks as though I had nothing to do with this carnage, my hips give lie. It’s always difficult to know exactly what will appeal to visitors, there is so much to see it’s difficult to whittle down the choices, but the 1.6 mile Millau Viaduct, above town of Millau (me-you–thanks Kit for the nmenomic) was definitely a hit. Spanning the valley of the River Tarn, the 984 feet bridge is the tallest in the world–the central pillar is higher than the Eiffel Tower. The Tarn River Gorge with its wild rock formations and limestone plateaus is considered the Grand Canyon of France. From the coasts to the mountains, the variety of the French landscape never fails to impress me. Sometimes the many years that I lived in the United States come back to me as alarms of sorts, usually delivered during my walks along the narrow and very quiet roads through the vineyards. The smoke off in the distance, for example. Surely a wildfire, the kind that consumed houses and vast tracts of land in California. And those solitary vans parked on the side of the vineyard, what are they doing? Who are they waiting for? One winter evening, with the light rapidly fading and still some distance to go, I saw one of these vans parked up ahead and actually detoured, convinced the occupant was just biding his time until a lone female walker happened by. So much for the paranoia of the city dweller. I now know that the ubiquitous white vans and small cars are part of the winter landscape in the vineyards. On subsequent walks, I’ve looked out and seen the pruners— bent down over the vines, slowly and methodically moving along the rows as they clip the long vine tendrils. 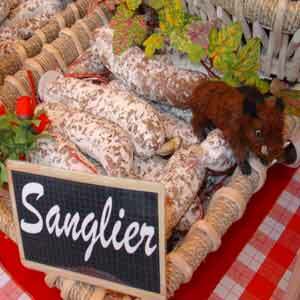 The smoke, I later discovered, is from small bonfires of clippings set at the edges of the vineyards; the scent of woodsmoke drifting over the villages, is another signature of winter in the Languedoc. But while winter around the vineyards might seem quiet to an outsider like myself, all languid pace and drifting smoke, it is in fact a busy season for the vintner. As the vines slumber the soil must be prepared for the coming season. 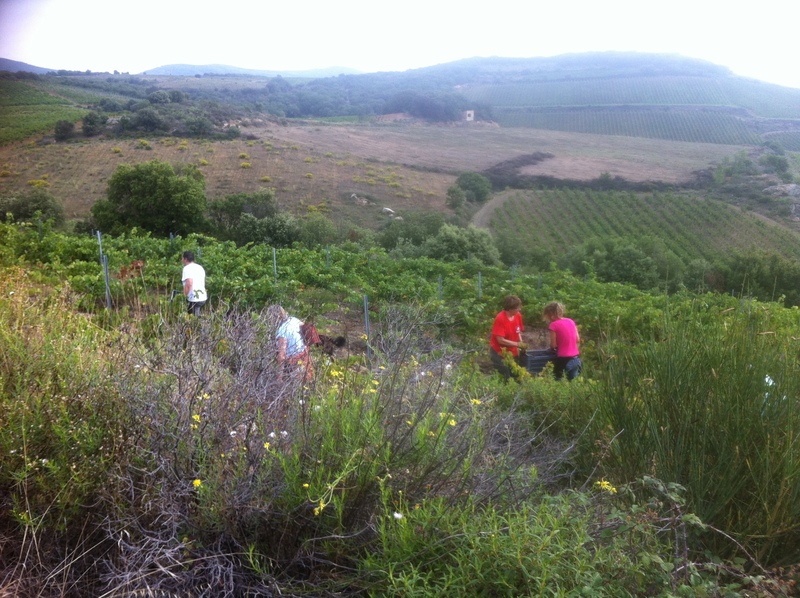 At Domaine de Cébène, Brigitte and Stéphane began pruning the Mourvèdre and Carignan back in January, and continued with Mourvèdre, Syrah and Grenache over the following weeks. The vines are pruned using a ‘gobelet’ technique which requires no wires to attach the plants. “The same as the ancients have done before,” Brigitte explains. 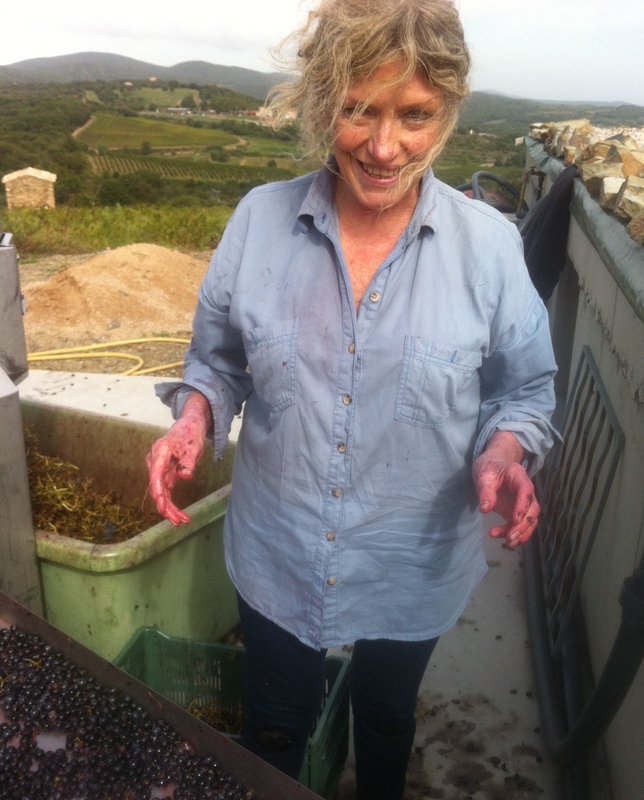 In March, one sunny and blustery morning, I walk with Brigitte through the rows of Carignan—the old ladies as she calls them, some of them planted around the time of the First World War. As befitting their age, they are gnarled and fragile, barely clinging to life it would seem. 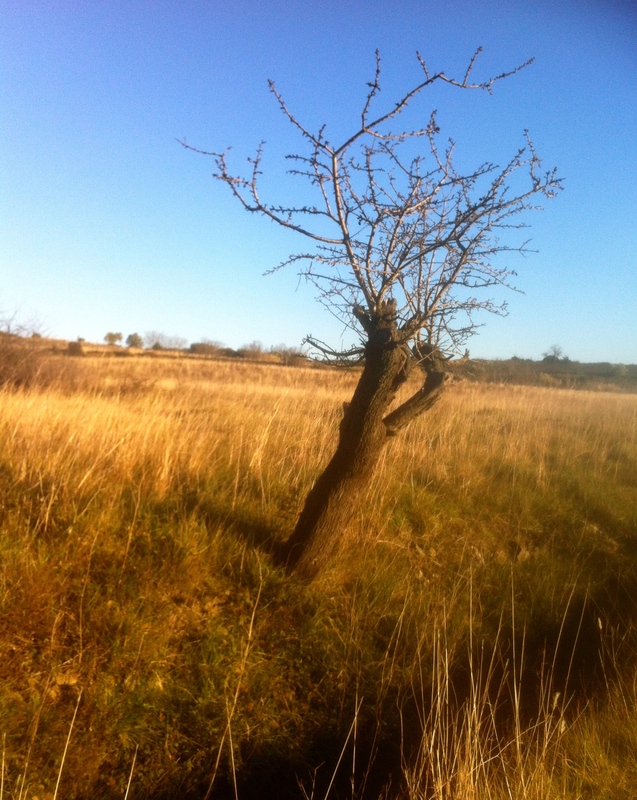 Brigitte stoops to snap off a branch, it is as dry and dessicated as charcoal. Hard to imagine that in a few months these ancient vines will produce the fruit that is basis for the Domaine’s award winning Felgaria. But while the old ladies are taking their long winter’s nap, the weeds and wildflowers all around them are energetic with new growth. Since they compete with the vines for needed nutrients, they must be removed. “This is a job we do for one or two hours a day, we don’t have time to do more.” Brigitte explains, as she yanks out a clump of yellow flowers. “But if you don’t remove them, they will eventually invade the vines. Behind us though, work is finally underway on the mazet, the ancient stone hut that by spring will serve as Domaine de Cébène’s tasting room. A small parcel under the mazet will be planted with additional Carignan vines. At the entrance to the estate, tractors have been preparing the ground for construction of a decorative stone wall to welcome visitors. Work on the mazet and stone wall were supposed to have been completed last winter in time for the summer season, but there were numerous delays. “Now it is finally happening,” she says. “I am so happy. With only one regular employee, Brigitte must take on most of the work of running a business —both physical and administrative — herself. Regardless of the season, this creates a varied, if exhausting, quality to her days. 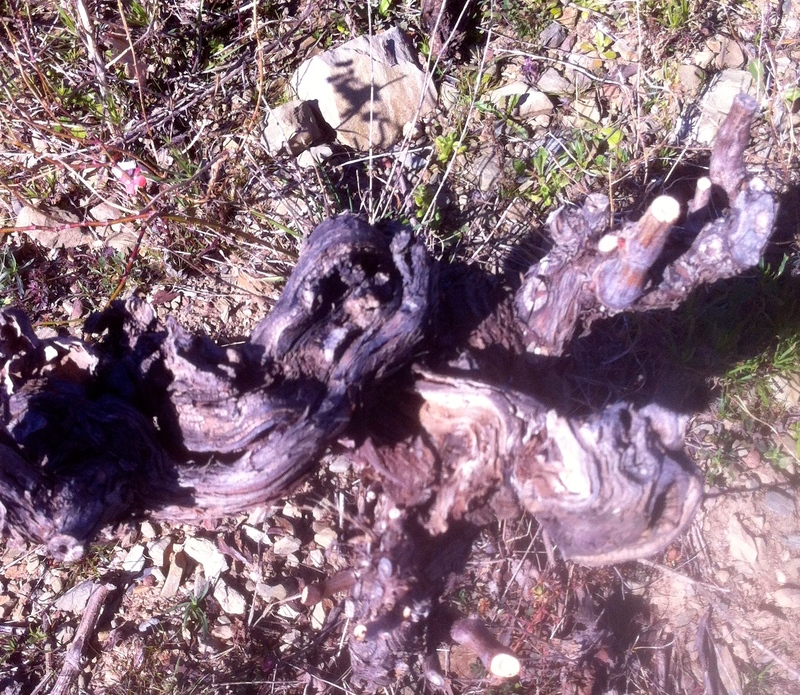 A recent morning, for instance, spent removing trees to make way for more Mourvèdre vines. “Lots of noise, lots of wind,” she says describing the work, “And the taste of schiste in my mouth and between my teeth.” The same afternoon, a meeting with a group of tourism officials to discuss plans for a vintage car ralley planned for June, the first such event in Faugères with participants arriving from all over France. 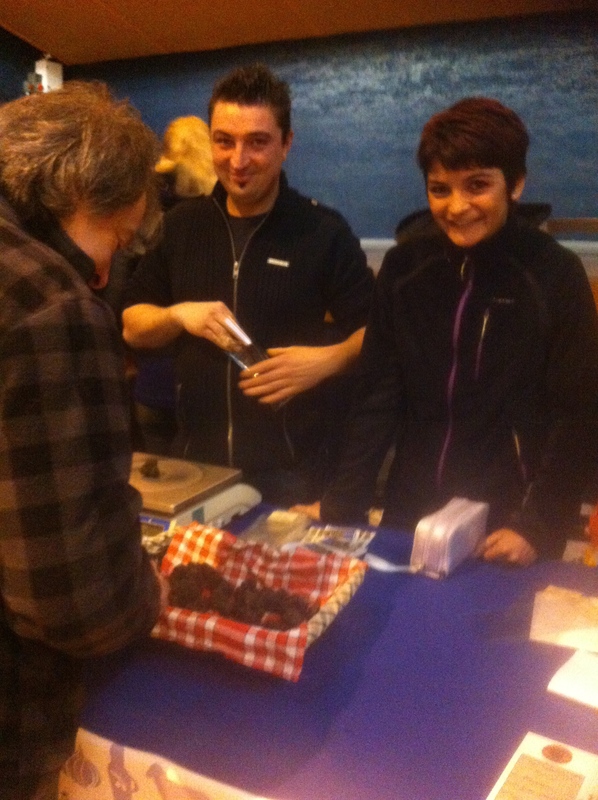 All the work involved in making wine of course requires work to market the product. Trade shows—in the past few months Brigitte attended events in Scotland, Germany and Brussells—offer the opportunity to gain exposure for her wines through contact with old and new customers. Of all the events, the Montpellier based Millésime Bio attended by organic, or bio, growers from around the world is the most important and prestigious. Although attendance at such events take time from an already.packed schedule, Brigitte says it is part of the work and definitely worthwhile. 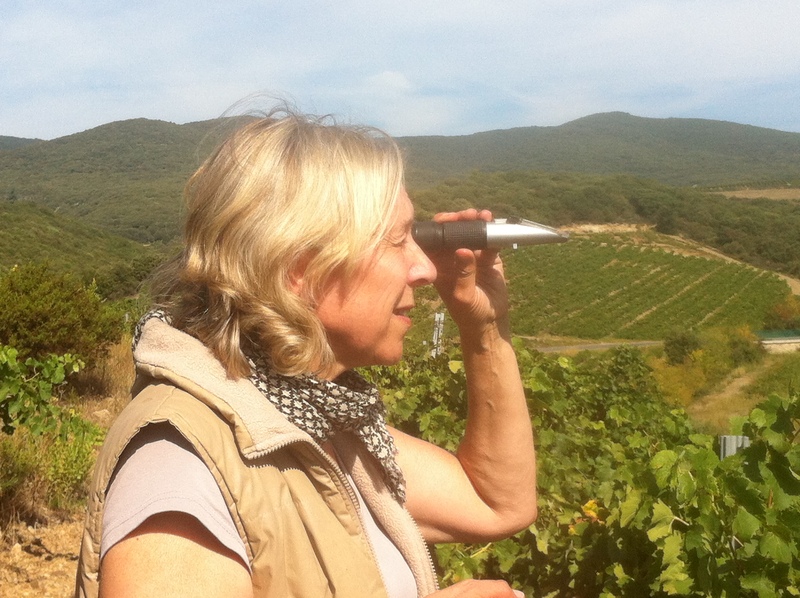 A visit to Domaine de Cébène by wine journalists back in January presented an opportunity for Brigitte to show off her product and also a challenge calling for some quick thinking. “To celebrate their first visit to the new cellar I wanted to organise one of my first ever full vertical tasting (different vintages of the same wine type) to emphasize differences between various vintages.“ Comments would offer valuable feedback on her wines since the beginning of Domaine de Cébène, she explains. Never a quiet moment, even in the dark of winter.